Mercedes-Benz has freshened up the B-Class with a series of tweaks including updated engines, new technology and some minor styling revisions. The updated car was unveiled at the 2014 Paris Motor Show and is available to order now, with deliveries starting early in 2015. There's nothing earth-shattering, but the mild work-over makes the B-Class a slightly more alluring family car, largely down to a wider and generally more efficient engine choice, plus an improved infotainment interface. The facelift itself is very mild, comprising new integrated daytime running lamps and a slightly wider radiator grille at the front, plus a re-shaped and chrome-enhanced rear bumper. Inside, the freestanding infotainment display swells to eight inches in size and the control dials are re-designed. There’s now a choice of 12 colours for the interior ambient lighting too and buyers can specify a starter button instead of having to turn a key. The only new engine is a four-cylinder 1.6-litre petrol powering the new B200, producing 156PS and available in front-wheel drive only. As per the majority of the B-Class range, it’s available with a seven-speed DCT automatic transmission. The base model remains the B 180 four-cylinder petrol, which with a manual gearbox costs £22,575 OTR. 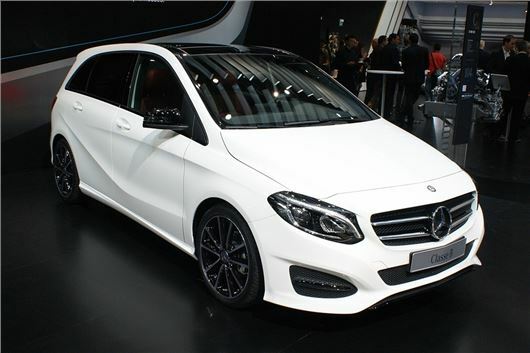 That means the B-Class’s prices have been lifted with its face, the B180 having started at £22,020 before the overhaul. The four-strong diesel range remains, all with four cylinders and turbocharging, starting with the 109PS B180 CDI, which returns 68.9mpg combined (or 70.6mpg with the twin-clutch auto equipped). The B180 CDI ECO does even better, registering a claimed 78.5mpg, which is over 4mpg improved on its pre-facelift predecessor. The B200 CDI musters 65.6mpg, while the top-of-the-line diesel, the B220 CDI 4Matic, which has 177PS and four-wheel drive, impressively returns the same 68.9mpg figure as the base B180 CDI. Finally, the B-Class Electric Drive will come to the UK from 2015, powered by a 180PS electric motor that can push the B-Class to 62mph in less then eight seconds. Its claimed battery range is 124 miles. New available tech includes the Mercedes Connect Me system, which features a service that can contact a call centre automatically with the position and condition of the car in the event of an accident, as well as giving the driver the ability to check how much fuel their B-Class has using their smartphone. An Attention Assist feature is standard fit too, monitoring the driver’s alertness level and displaying it on the screen using a five-stage system.